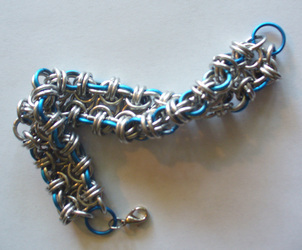 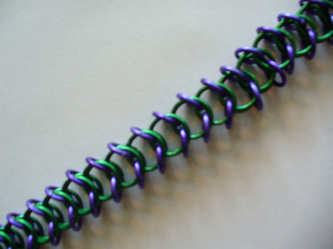 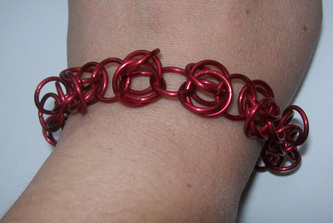 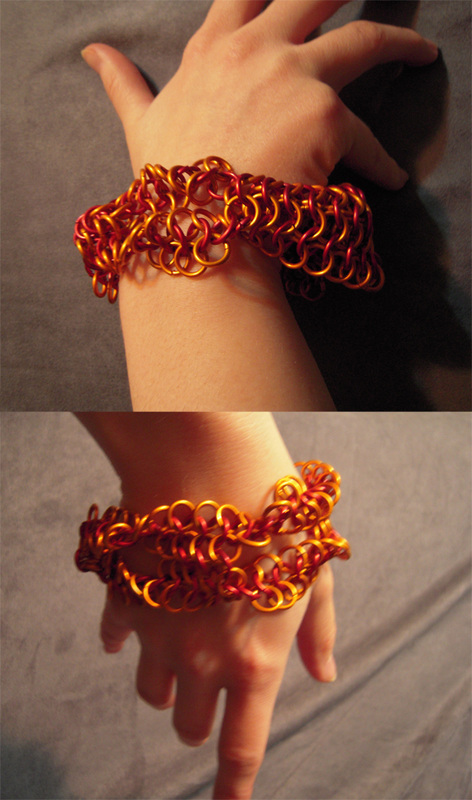 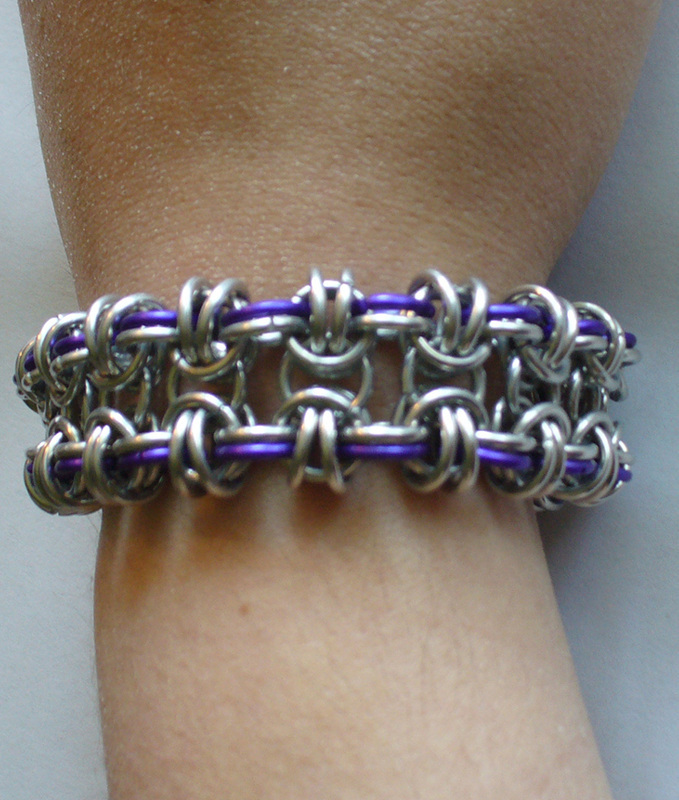 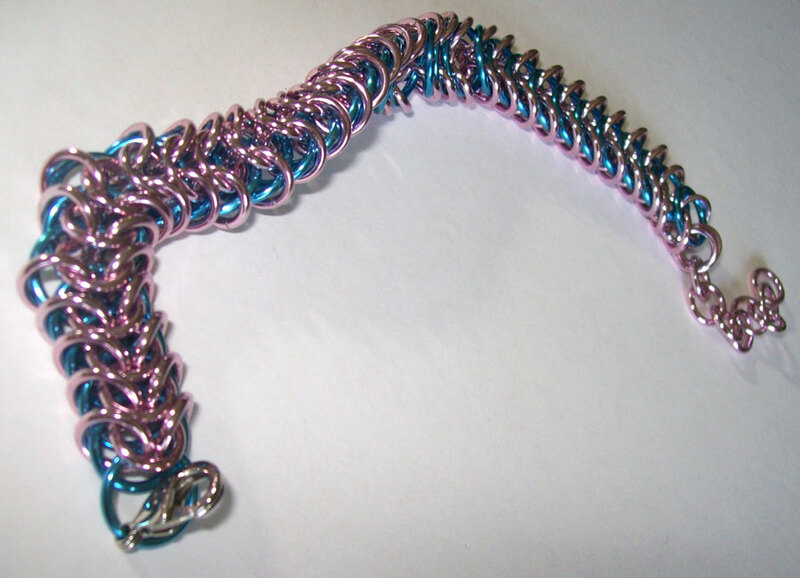 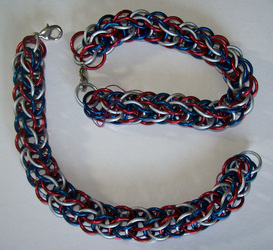 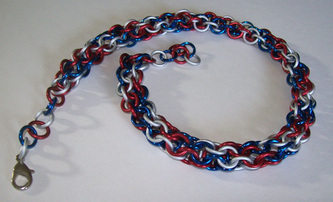 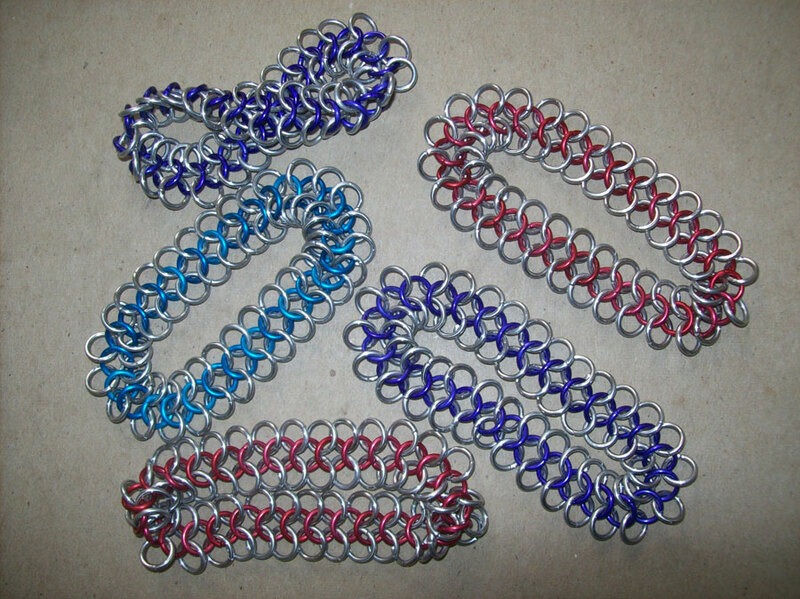 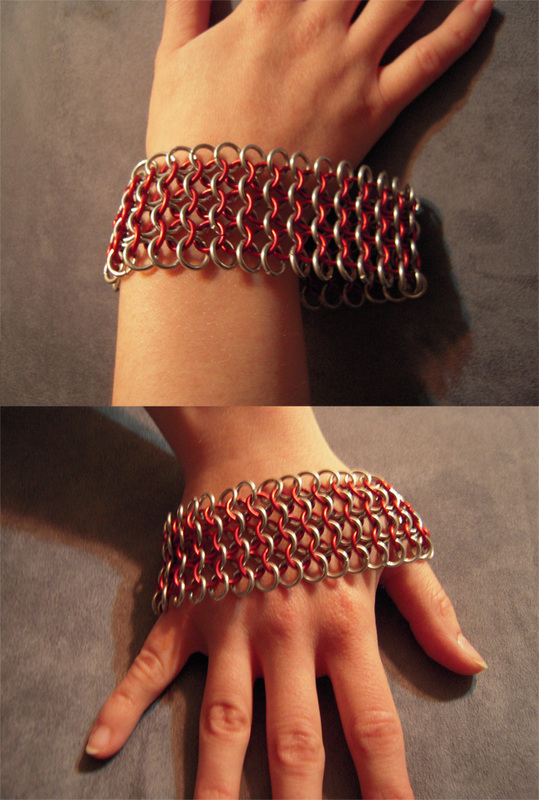 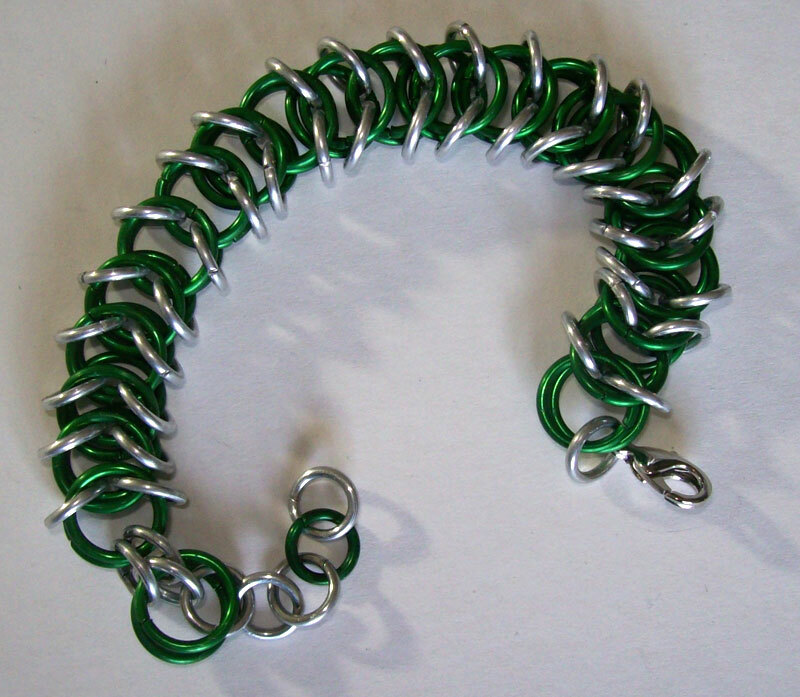 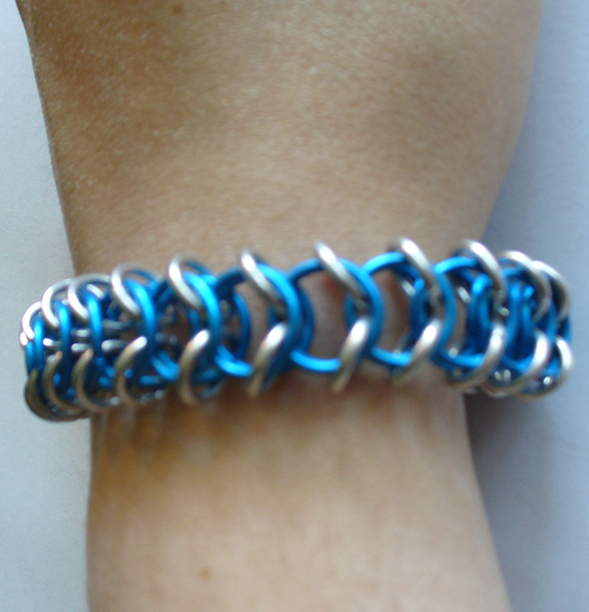 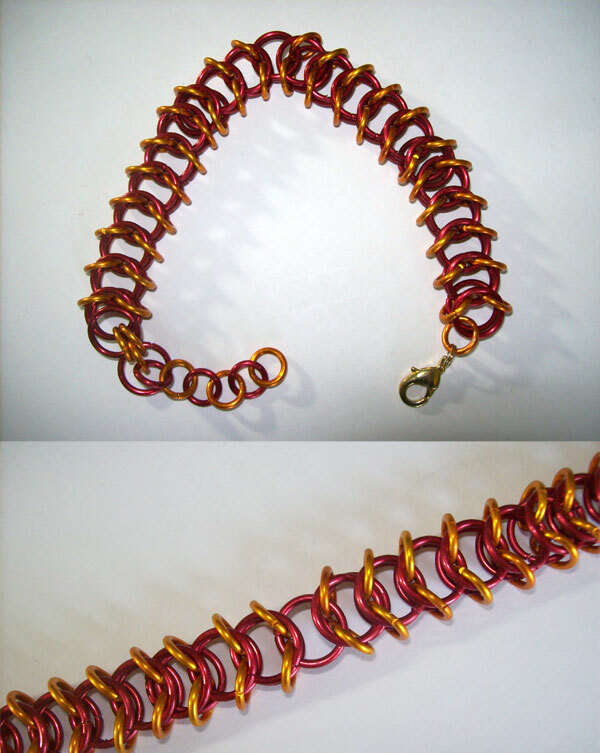 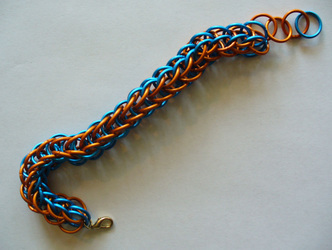 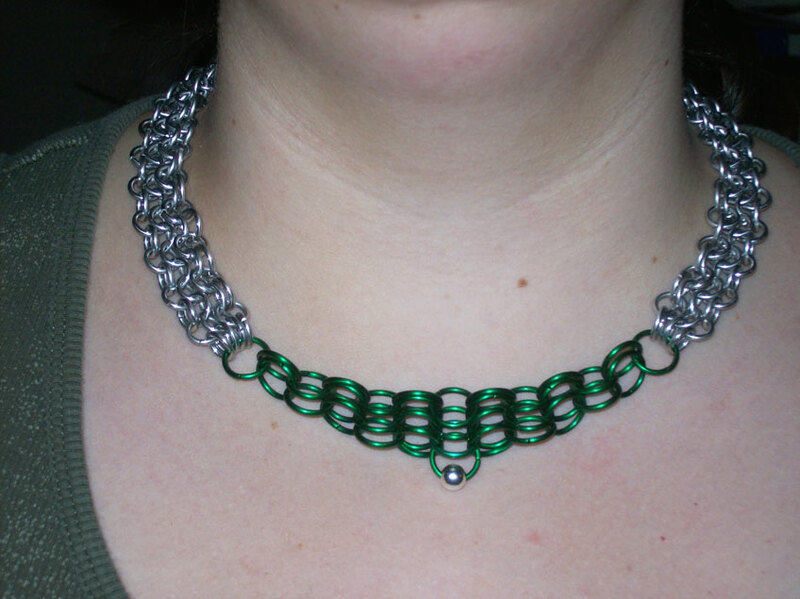 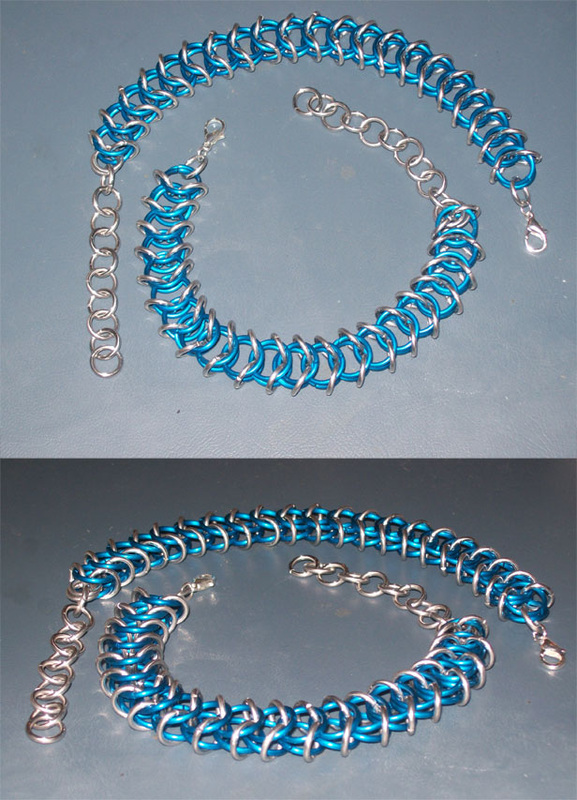 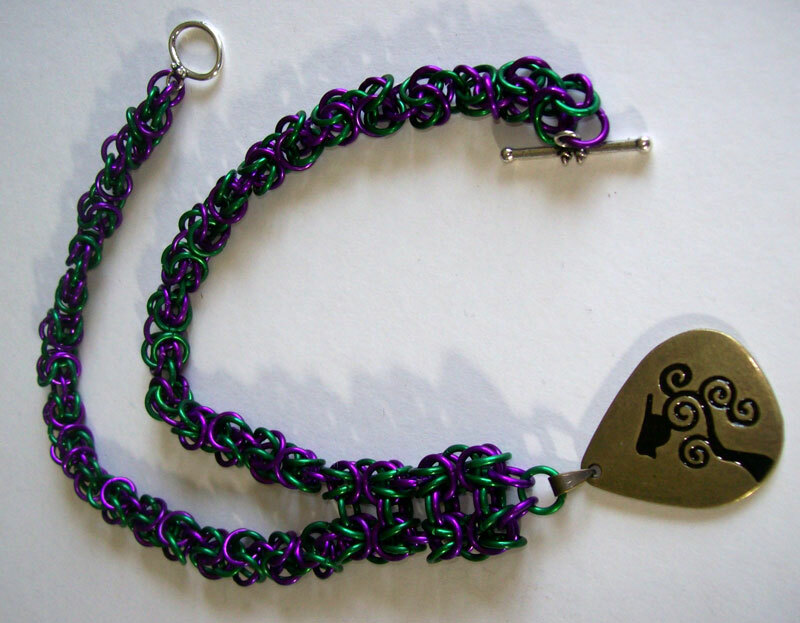 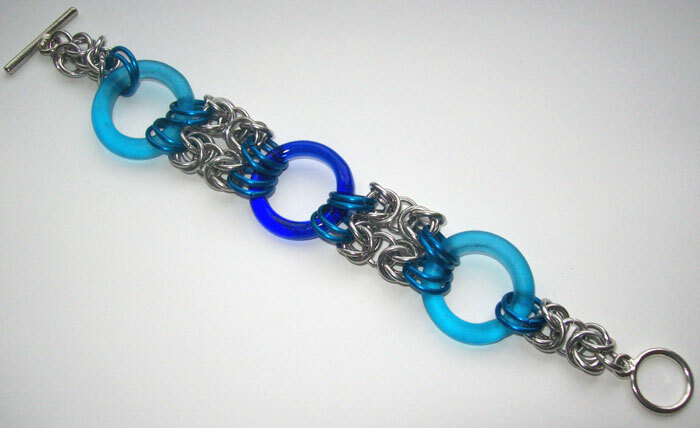 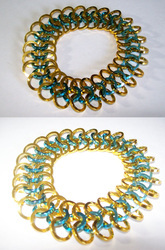 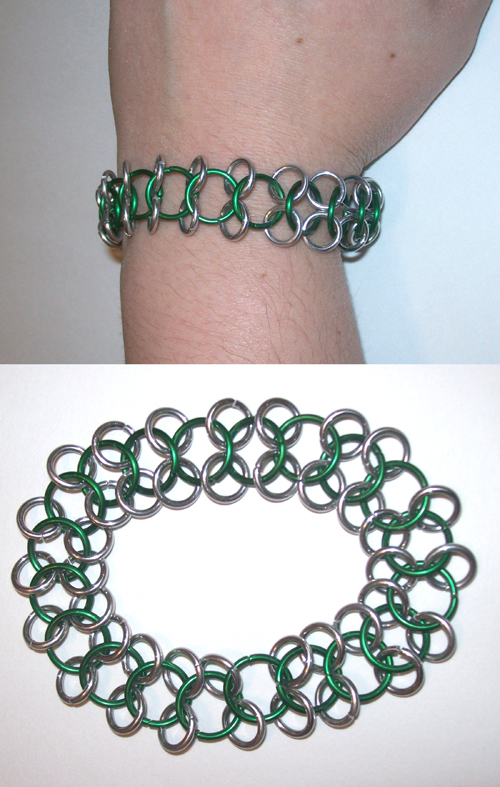 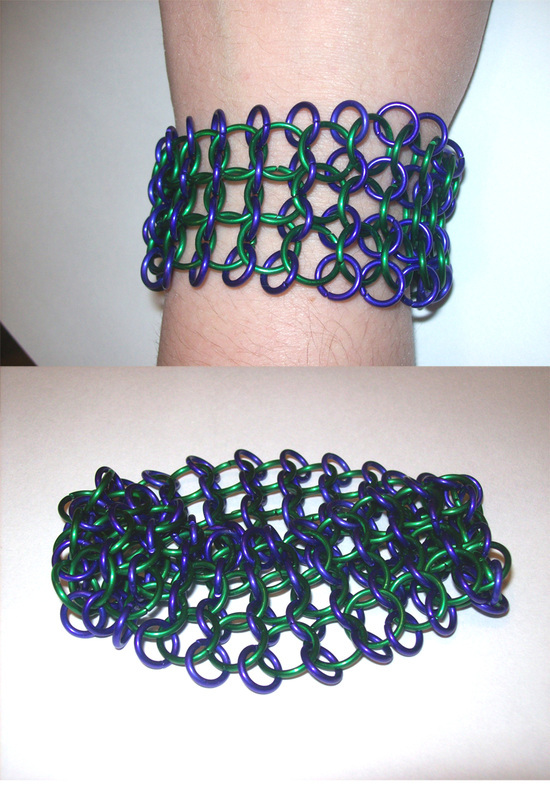 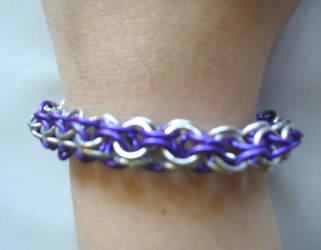 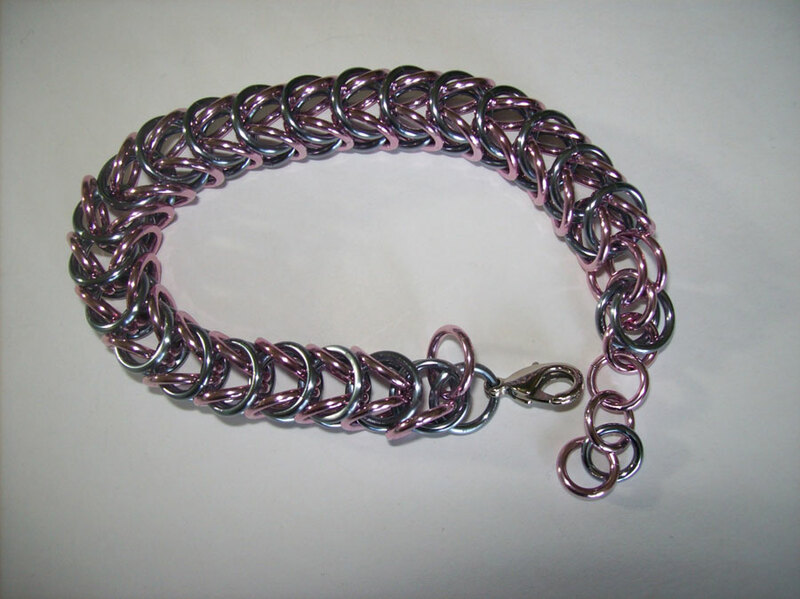 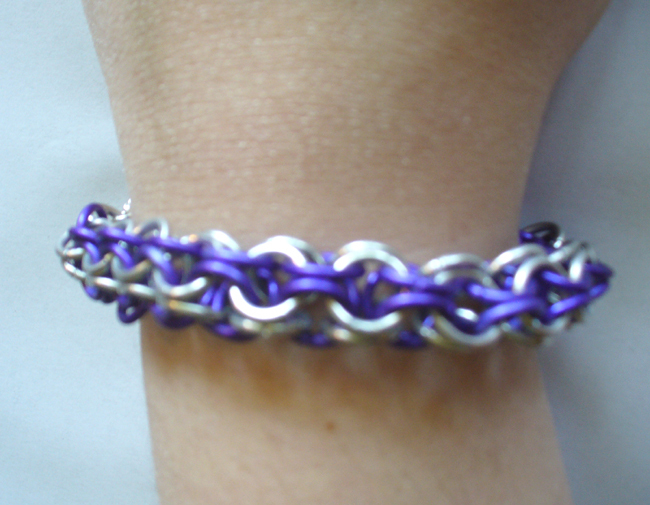 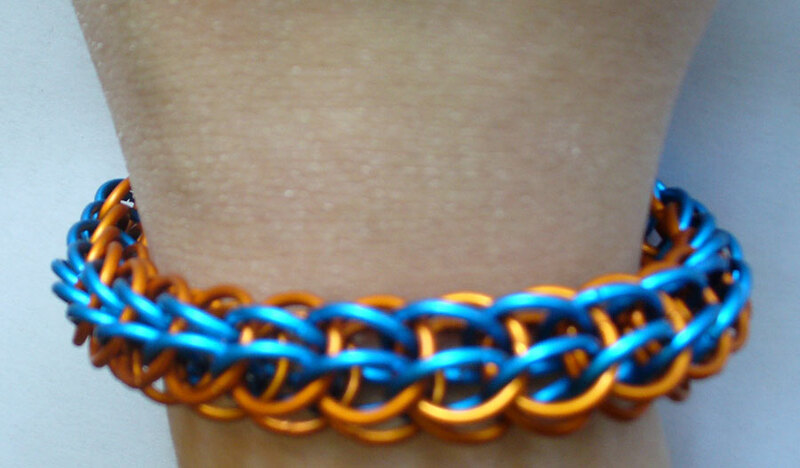 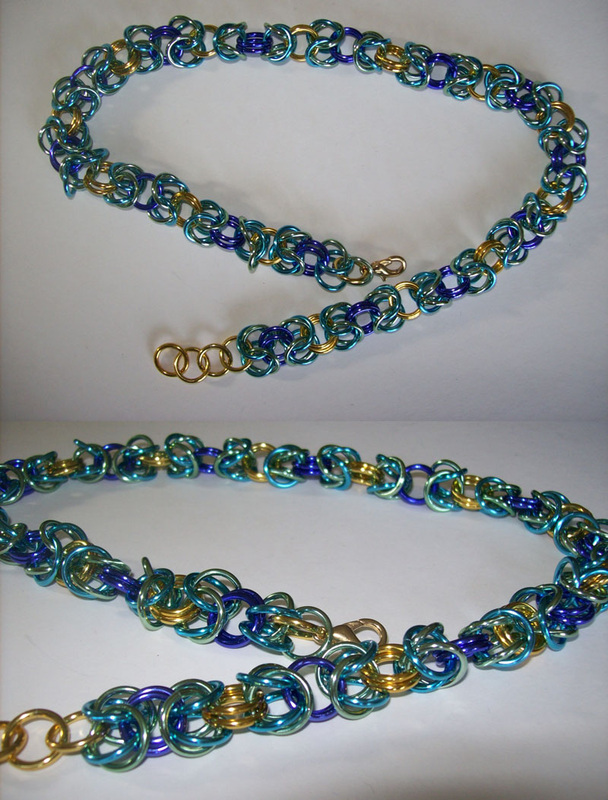 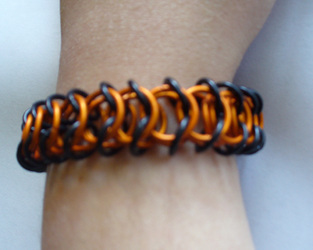 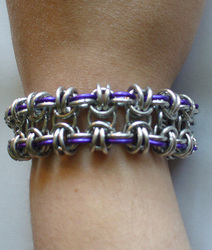 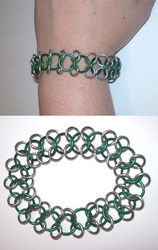 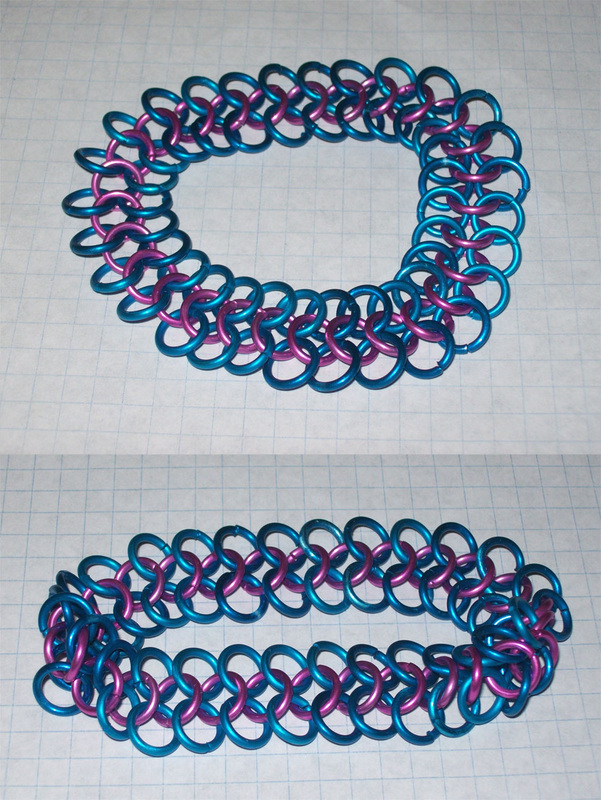 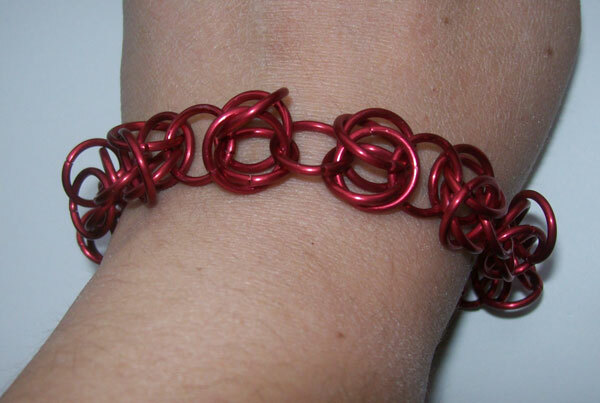 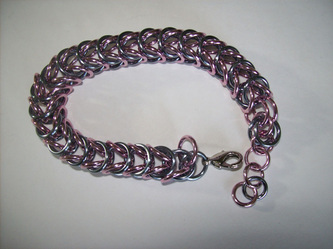 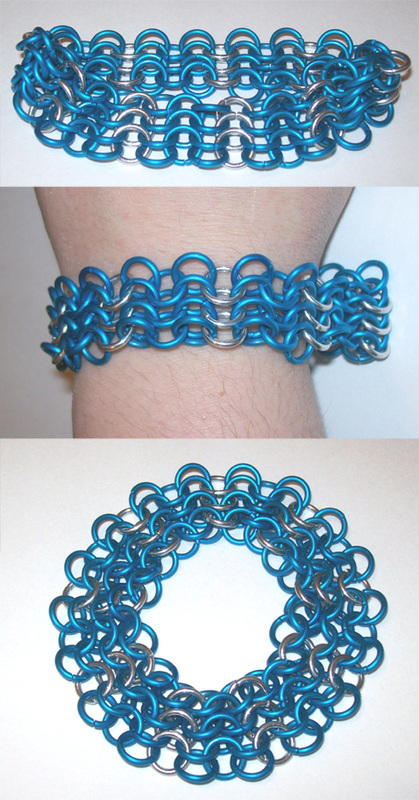 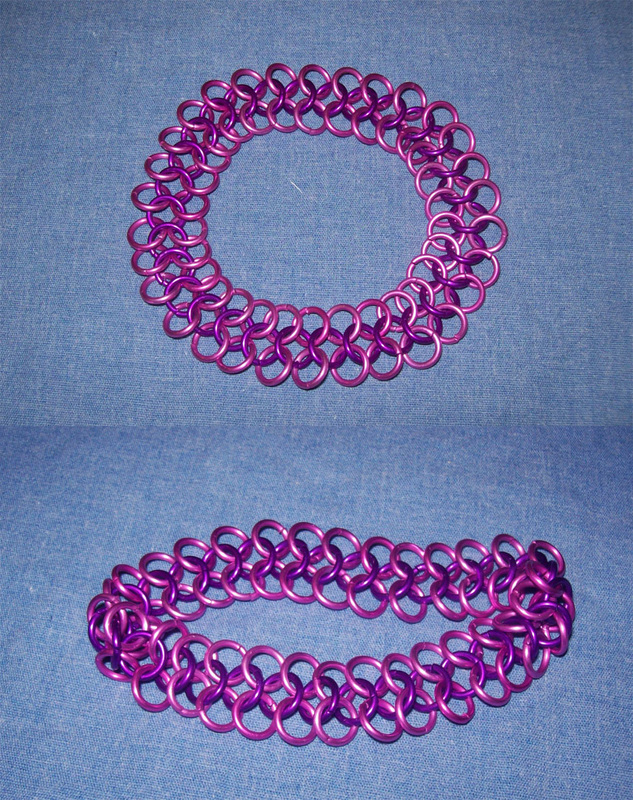 For those of you who are unfamiliar with the concept of chainmail (or chainmaille depending on who you ask) it is a process of weaving interconnected rings. 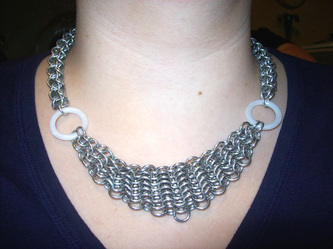 Most notably, it was originally used almost strictly for the purposes of armor in the form of chainmail garments such as shirts, coifs, and gauntlets. Now adays, however, it has come to be used for far more decorative purposes rather than protective. 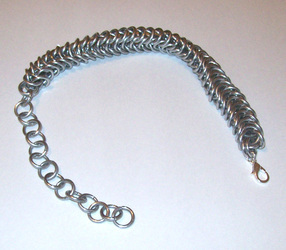 Accessories like belts and jewelry have become increasingly more common. 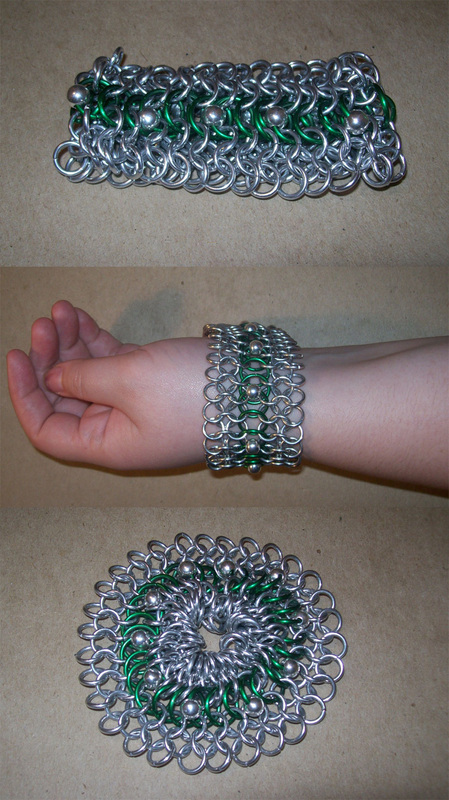 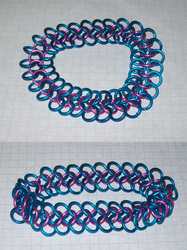 The process of making a piece of chainmail is a time consuming and tedious one. 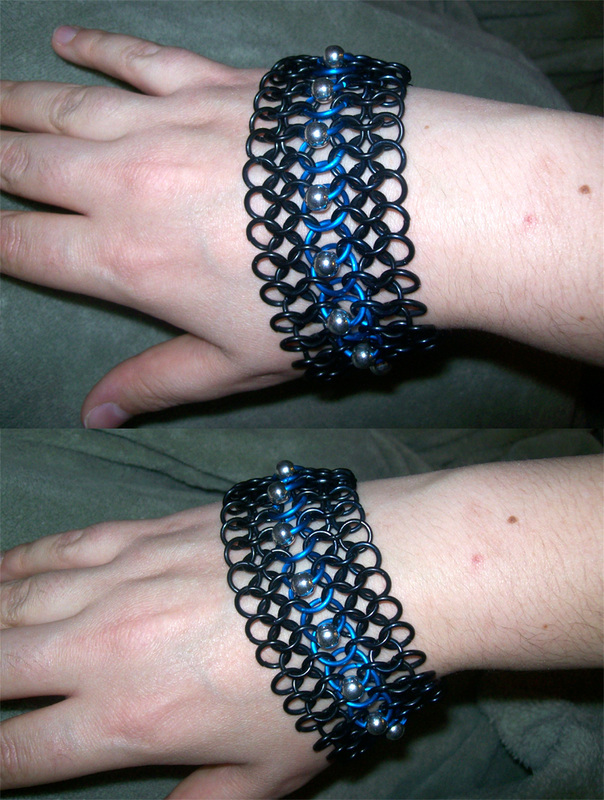 However, it's one that I greatly enjoy. 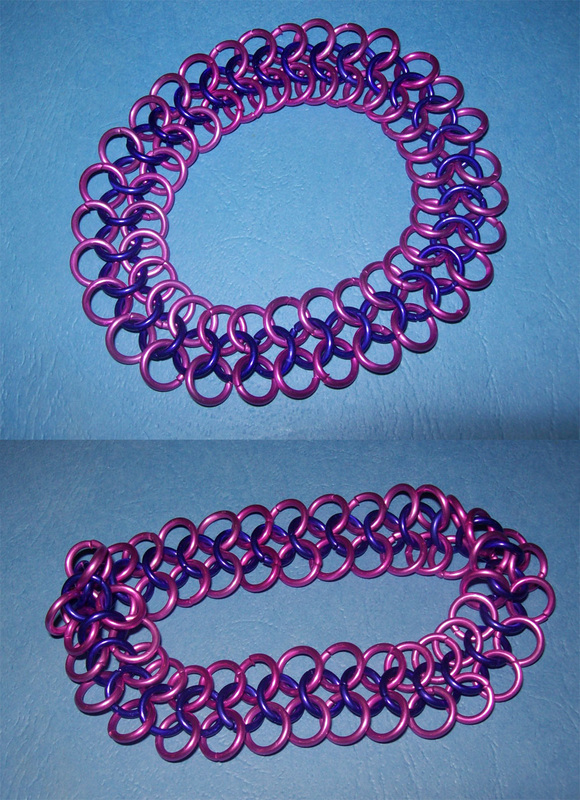 Each ring is opened and then closed into the pattern and it can be very painstaking work-- and sometimes even just painful if I do it for too long at a time. 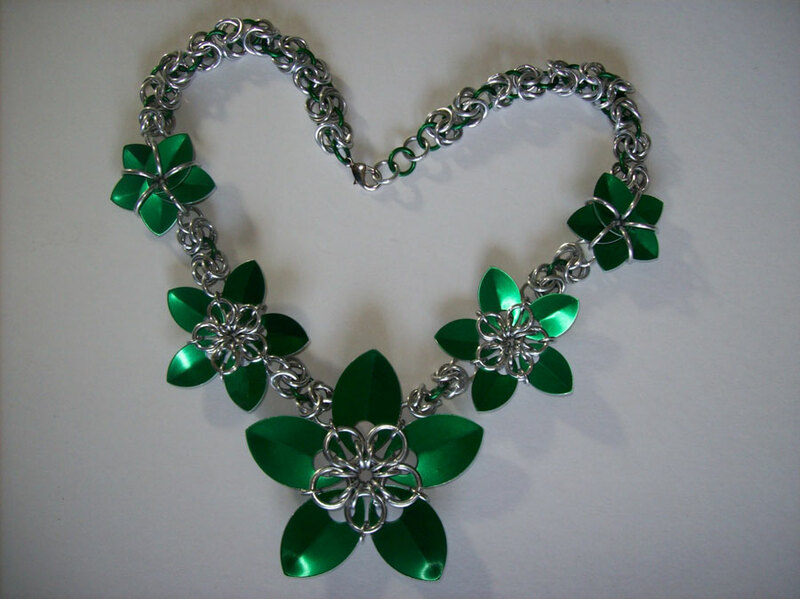 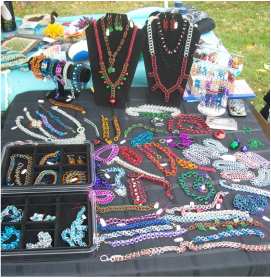 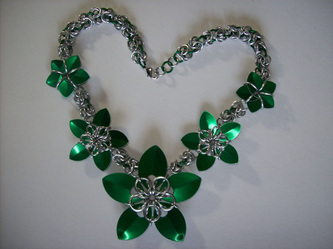 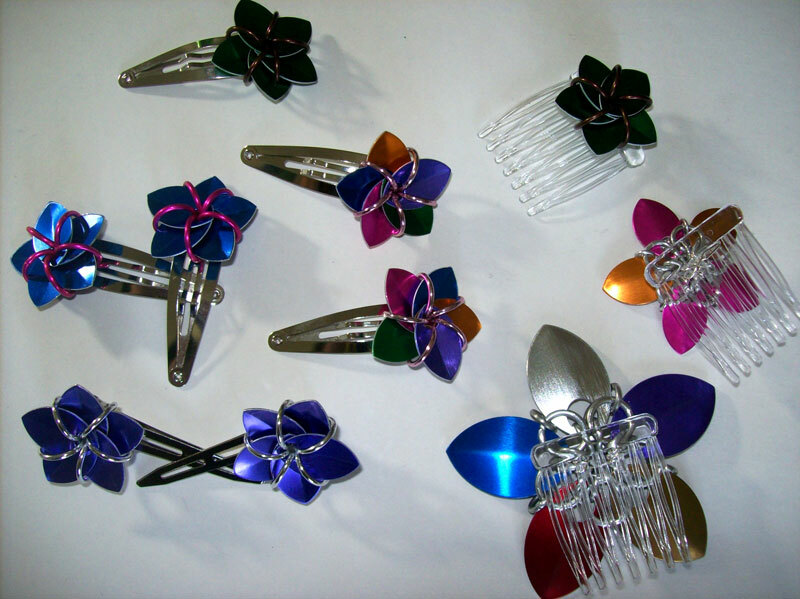 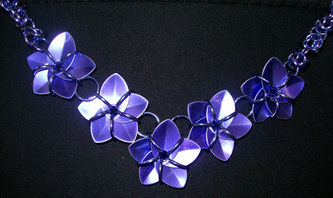 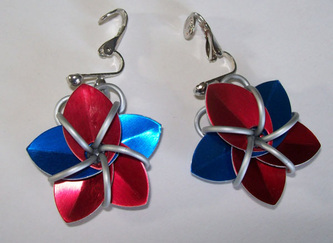 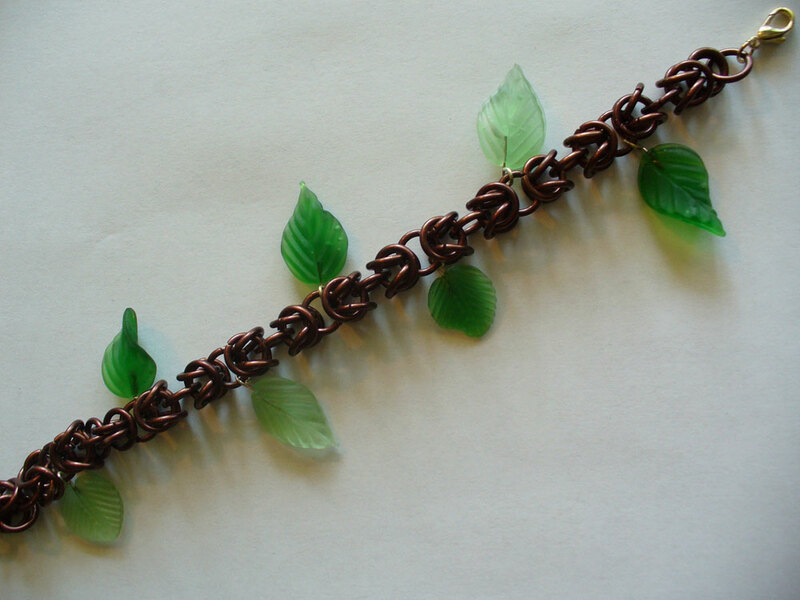 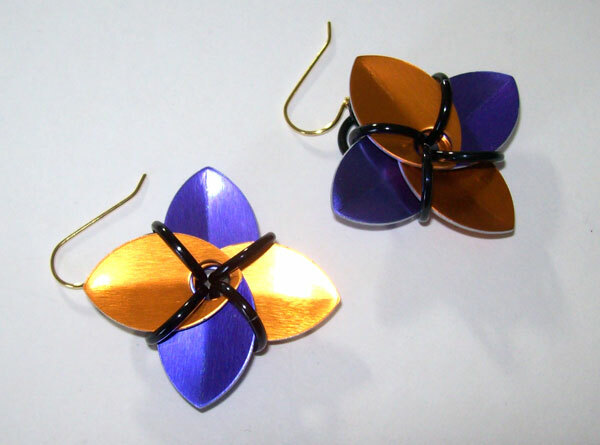 There are many different weaves and even more ways that they can be used to create a piece of jewelry. 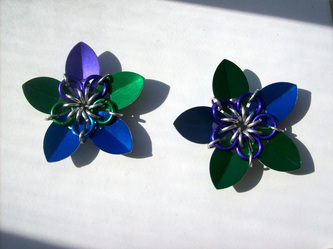 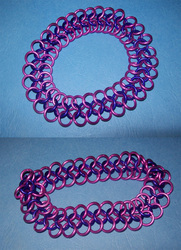 This leaves many hundreds of possibilities once you add in ring sizes and colors. 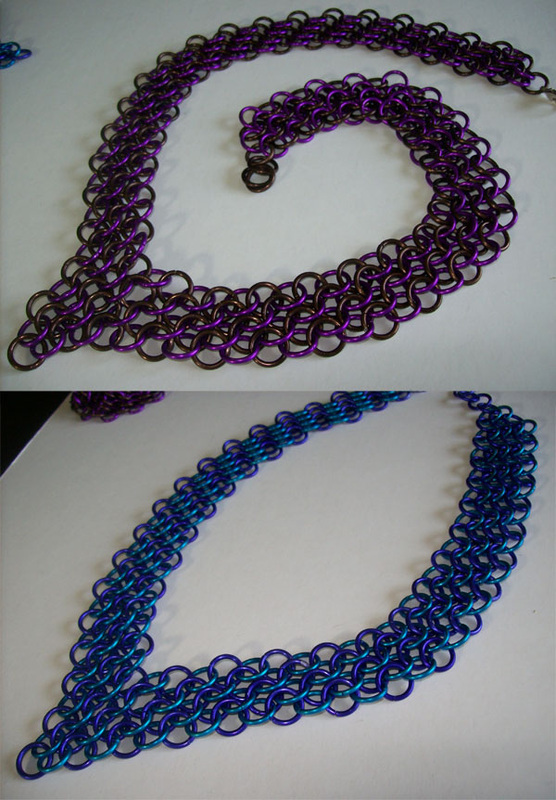 This is why I heavily suggest that anyone who doesn't see something that is just right for them to please ask about getting a custom piece created just for you. Below are several examples that cover only a small portion of what I am capable of producing. I have categorized the images based upon the weaves used in order to make it easier for you to decide what you like. 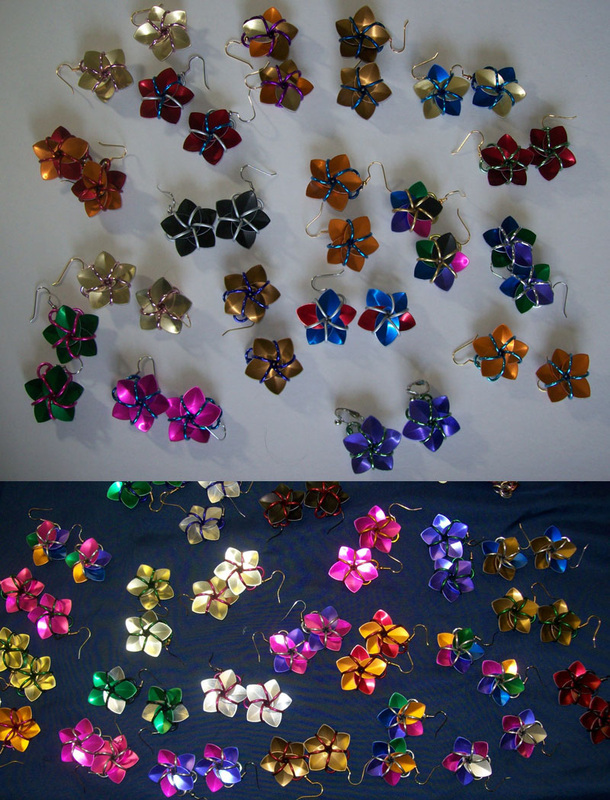 The examples I have shown will, of course, only show a small part of the color selections that are available, but will hopefully at least give you an idea of the patterns that can be made by using different color combinations. 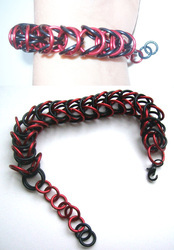 A weave that opens itself to a variety of looks, from elegant to masculine. 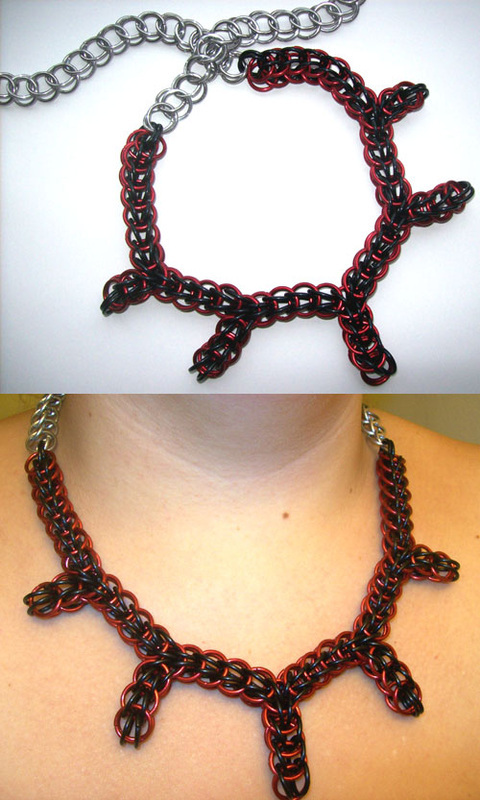 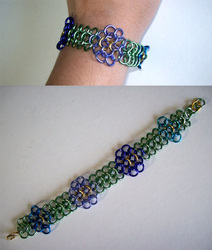 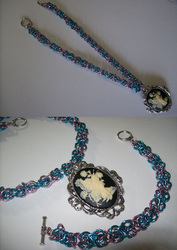 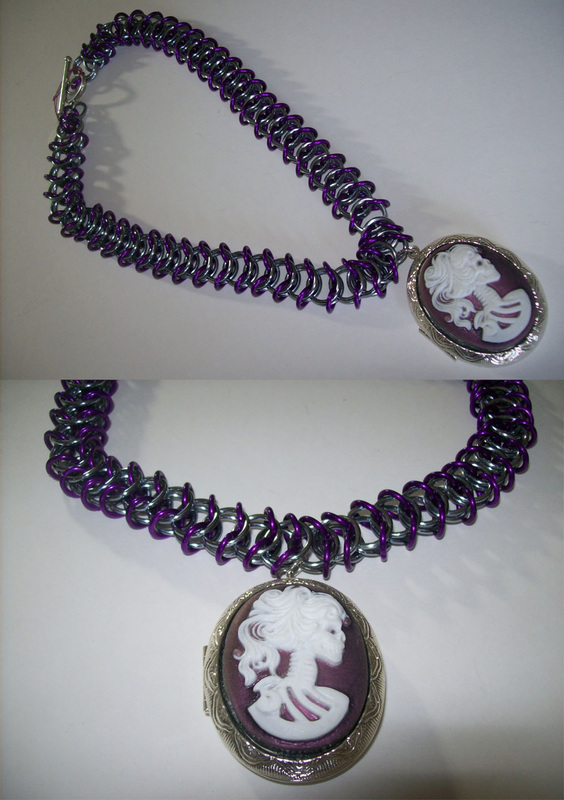 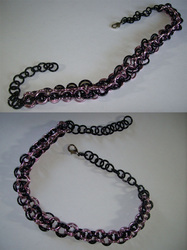 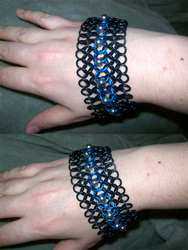 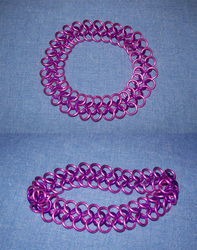 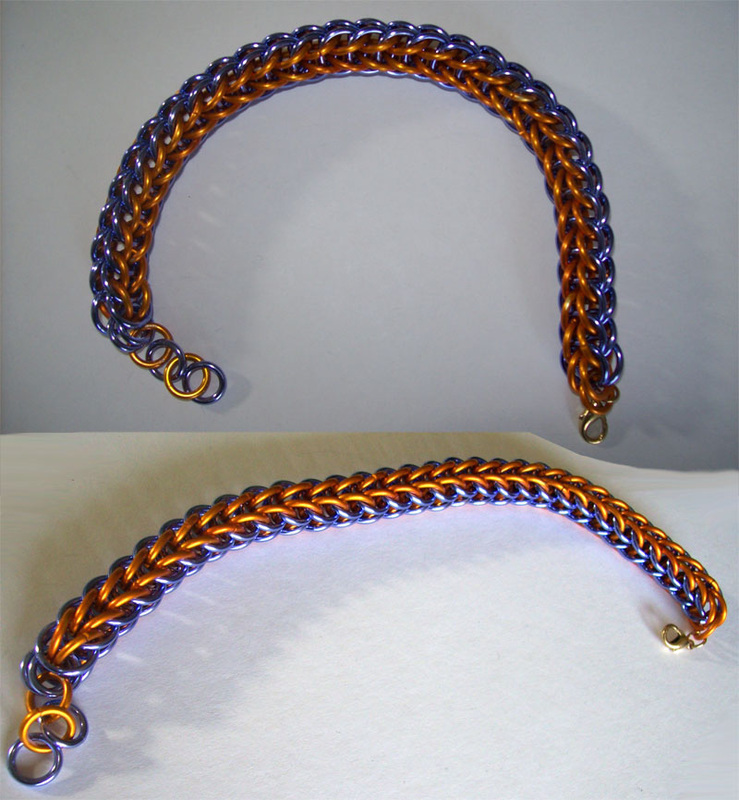 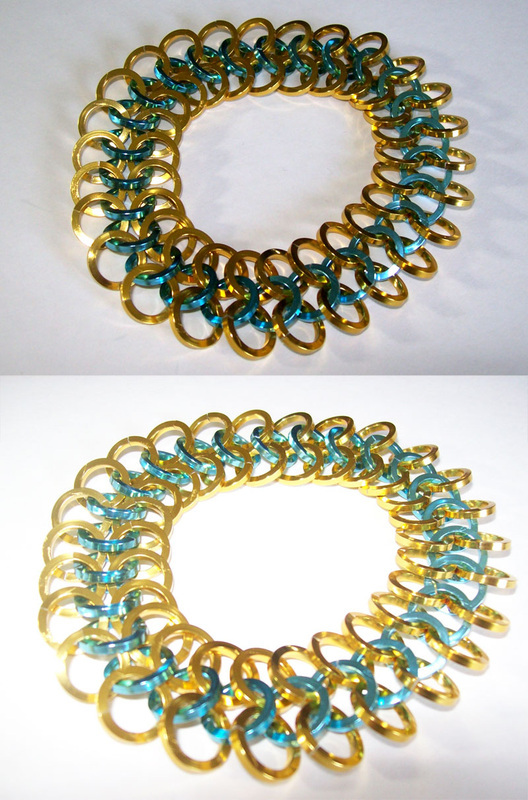 As you can see from the images below, there are a couple of variants that I have played with using the Byzantine weave. 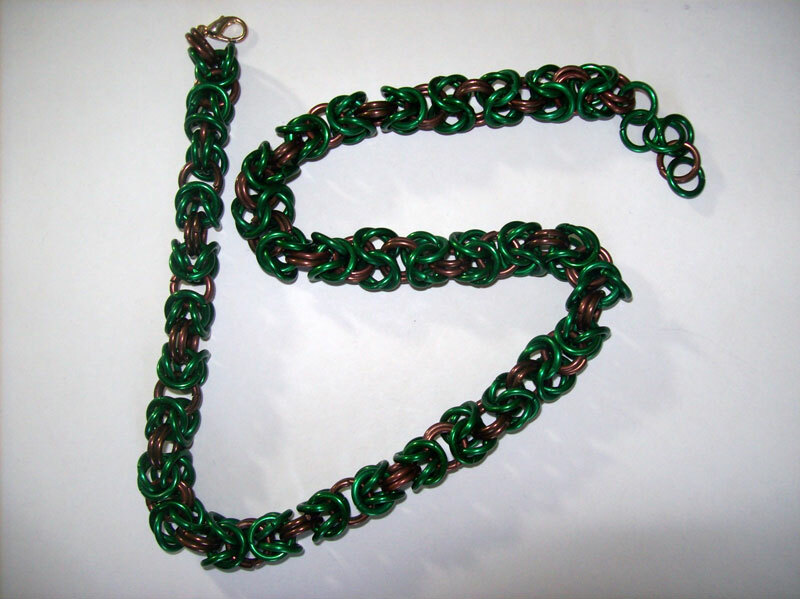 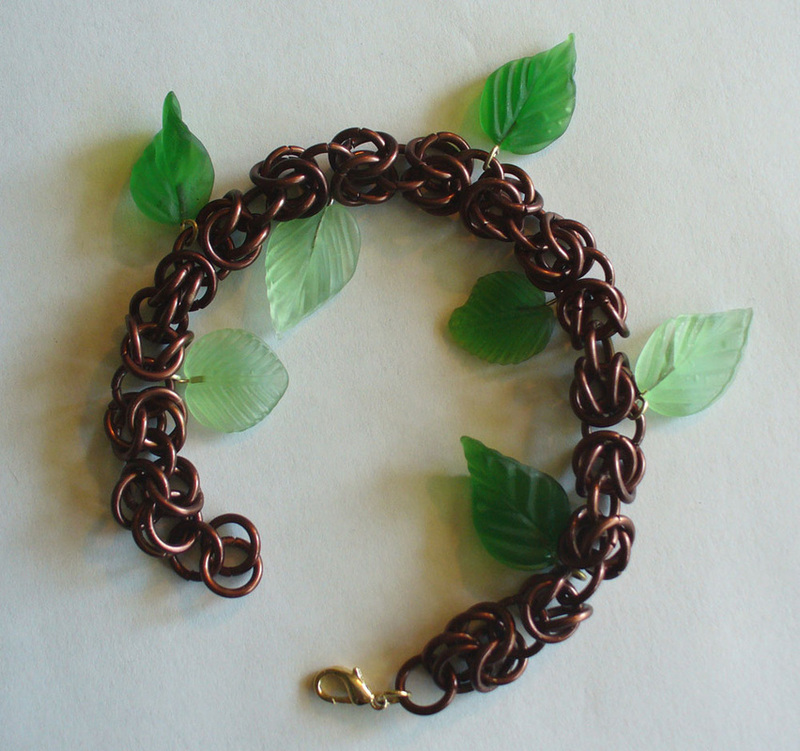 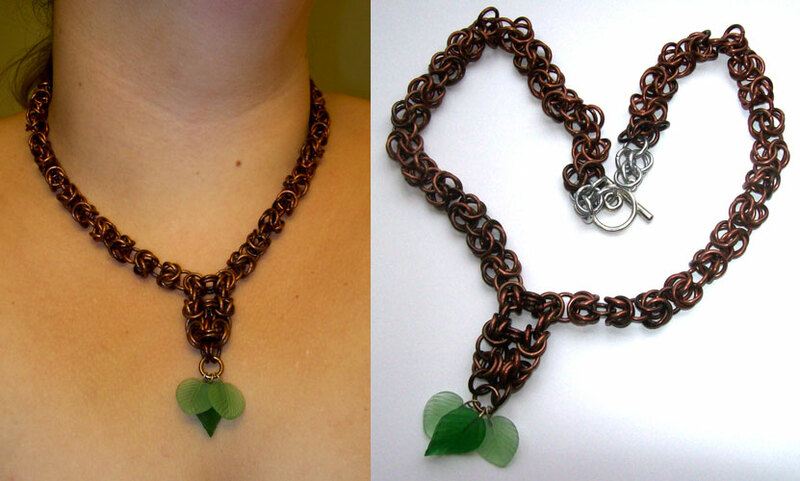 The first picture (green and bronze) is the standard Byzantine weave, used to make a lovely earth toned necklace in this case. 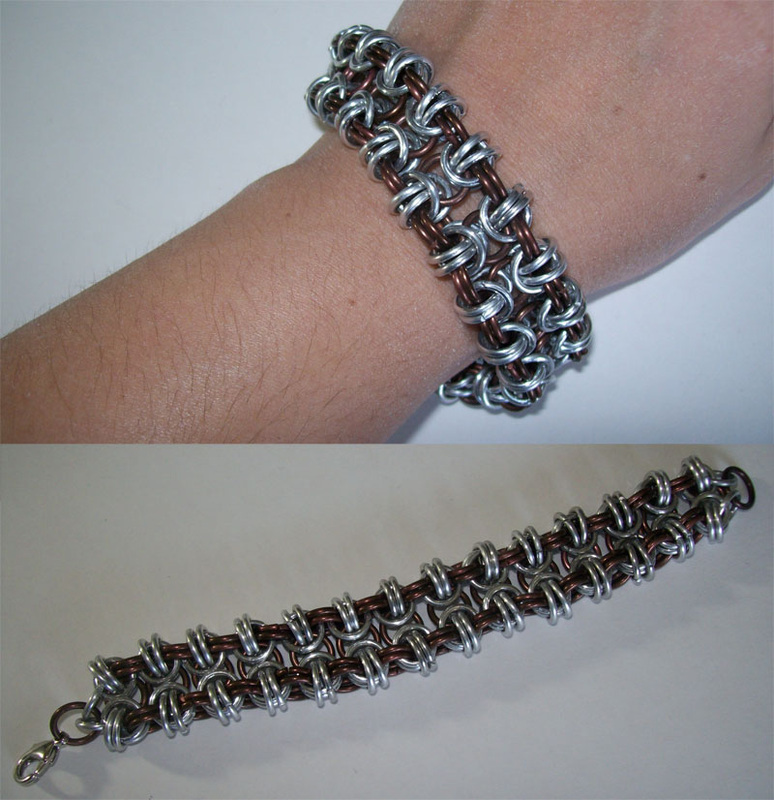 The second image (silver and bronze) is a variant that allows for a thicker, sturdier looking piece of jewelry. 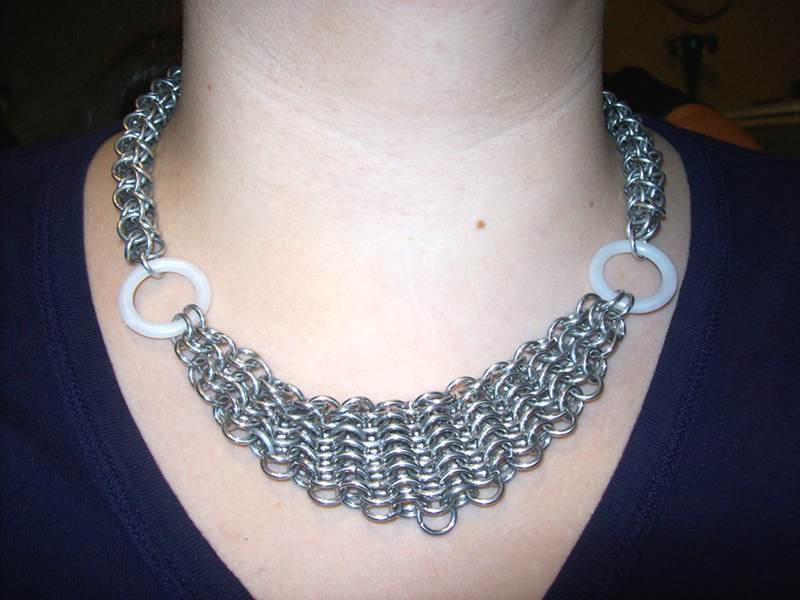 This first variant is often more appealing to men than some of the more delicate looking chainmail weaves. 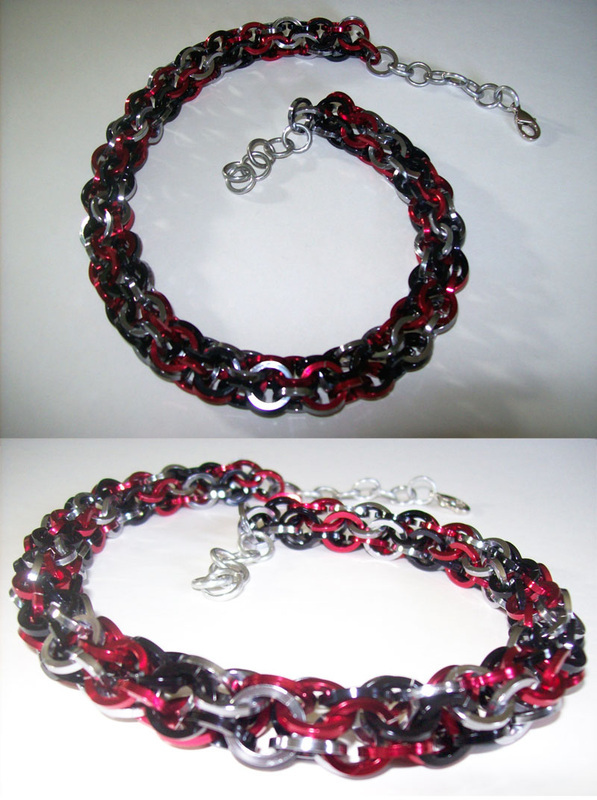 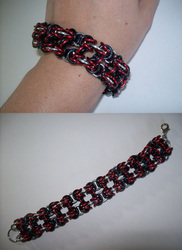 And the third image (silver, black and red) is a second variant that is still a thicker and more sturdy weave than the original, but with a little more finesse than the first variant. This is what I consider to be the 'standard' weave because the basic elements of this one are used in many of the others. This is also the weave that armor in medieval Europe was made in-- which is why it is called the European 4-in-1. 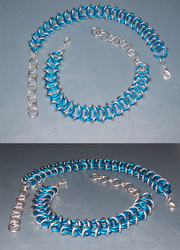 There is also an Asian/Japanese 4-in-1, but I do not work with it much. 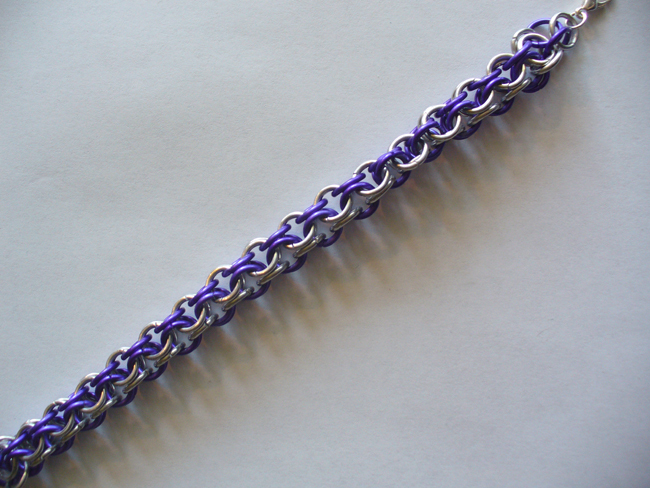 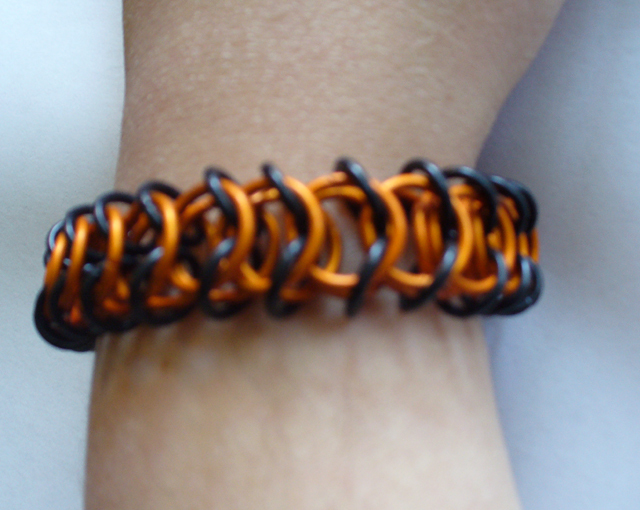 A simple, almost tubular, weave that can make for a fun piece for sure. There are a few different kinds of Persian weaves. The first-- and most prominently displayed in this gallery-- variant is the Full Persian. 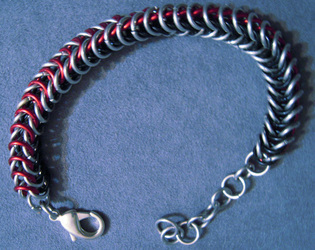 There is also a 3-in-1 Half Persian (the silver part of the red and black piece in the sixth image) and a 4-in-1 Half Persian, which I have only worked with once to date and do not recall if a picture was taken of the finished piece. Hopefully I shall remedy this soon.